JOIN US FOR A BOOK TALK AND SIGNING! There are a couple of book talks/signings coming up in the next week for the Legendary Locals of Pottstown book, co-authored by photographer Ed Berger and me. 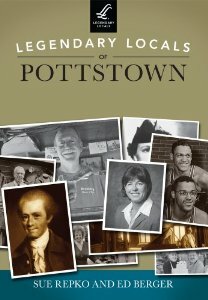 Come out to meet some Legendary Locals, learn more about the history of Pottstown through its legends, and how we put this book together. BOOKS WILL BE AVAILABLE FOR PURCHASE ($21.99) Look forward to seeing you! The first event is at the Pottstown Regional Public Library at 500 E. High Street this Sunday, from 1-3 pm. The library is opening just for us! Then, next Wednesday, November 6th at 7 pm, there is a talk/signing at the Schuylkill River Greenway Association at 140 College Drive in Pottstown. This is a really cool former PECO substation that is used by the Greenway and owned by Montgomery County Community College, and they’ve got a fabulous permanent exhibit about the history of the Schuylkill River. You can learn about Pottstown’s people and the river all in one fell swoop. Finally, thank you to Joe Zlomek of The Sanatoga Post and The Pottstown Post for publicizing the latter event!